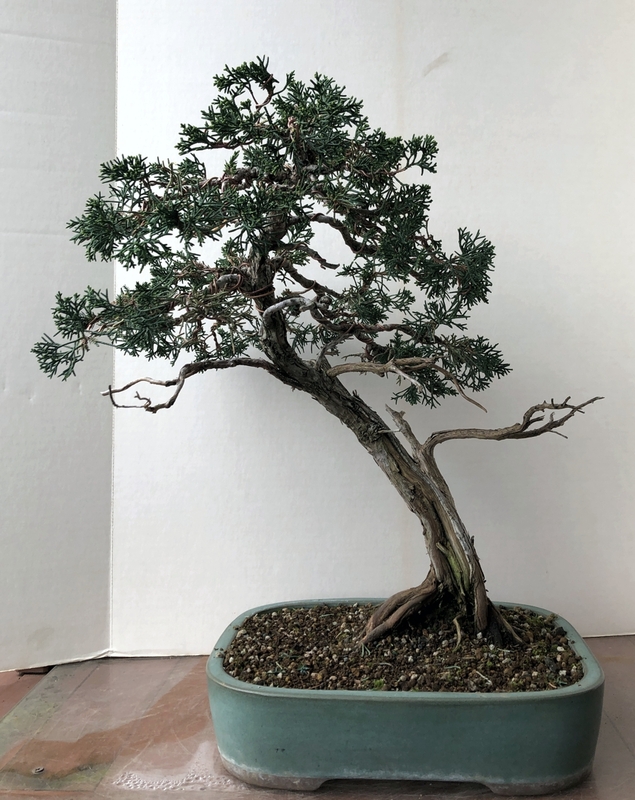 Re potting and refining trees has been the theme this Spring. 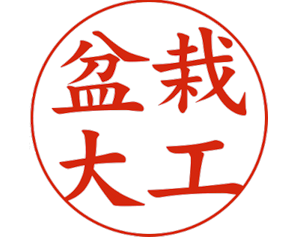 Many were already done but there is always refinement and assessments required. Today I have been working on some early tropical tree re-potting. With the tropical trees; I wait for the soil temperatures to be sustained above 50 degrees to start their work. I have little thermometers in the soil of several pots to monitor temperatures in the soil mass. Today, temps have reached a steady 55-60 degrees in the soil of most of my trees. I needed to work on a new Banyan trees cutting that has been rooting for a year in some very bad potting soil. 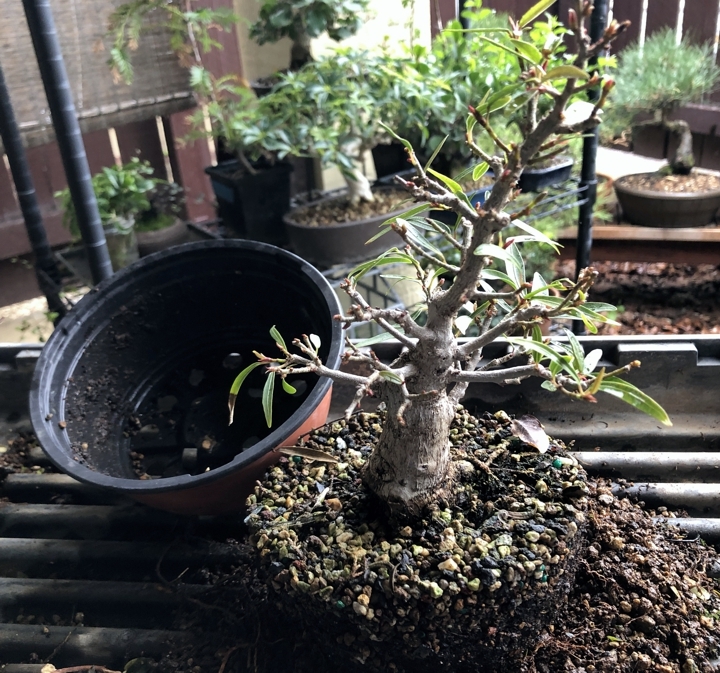 The cutting was given to me by a person who has a gorgeous large banyan tree bonsai. It was coming out of potting soil and into a well draining mix with a new orientation for its new pot. 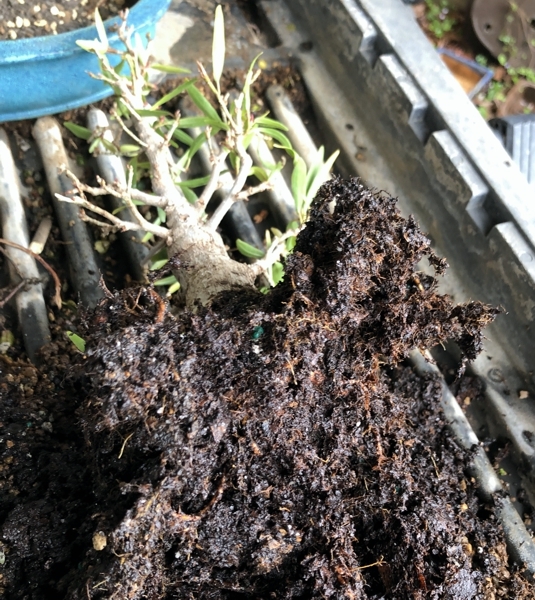 Banyan was rooted in a very muddy potting soil. Banyan rooting from the original cutting and potting mix. 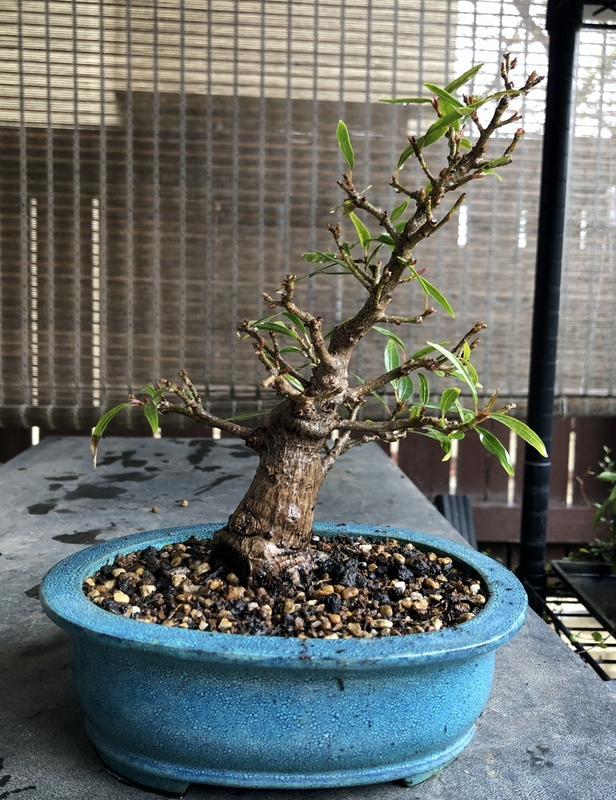 Banyan after re-potting. 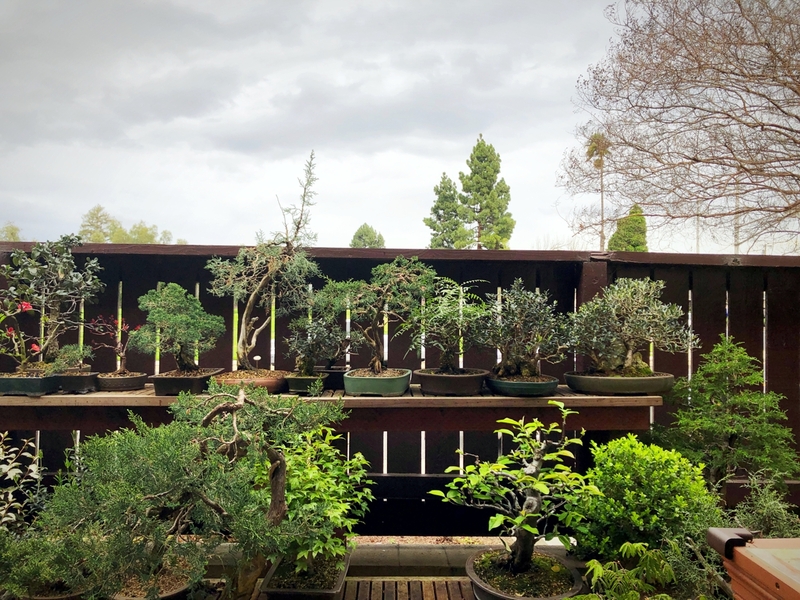 Obviously the crazy bonsai guy was in a mood this day. 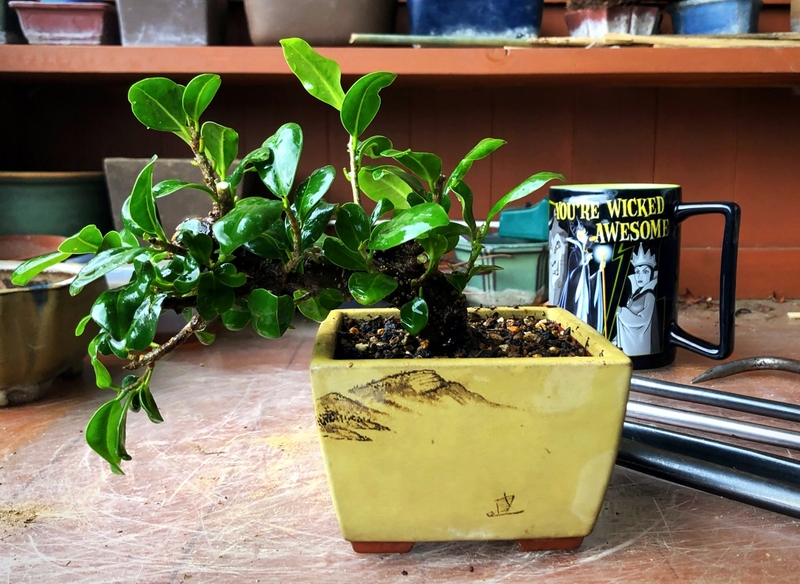 I was also gifted a willow leaf ficus from an artist who purchased it as part of the California Shohin Convention workshop. She did not like the rigors of caring for it in Northern California. Many ficus are considered so hard to keep health here. That is not the case. They are not “house plants” and they need to be outdoors unless temps go below 40 degrees for most species. 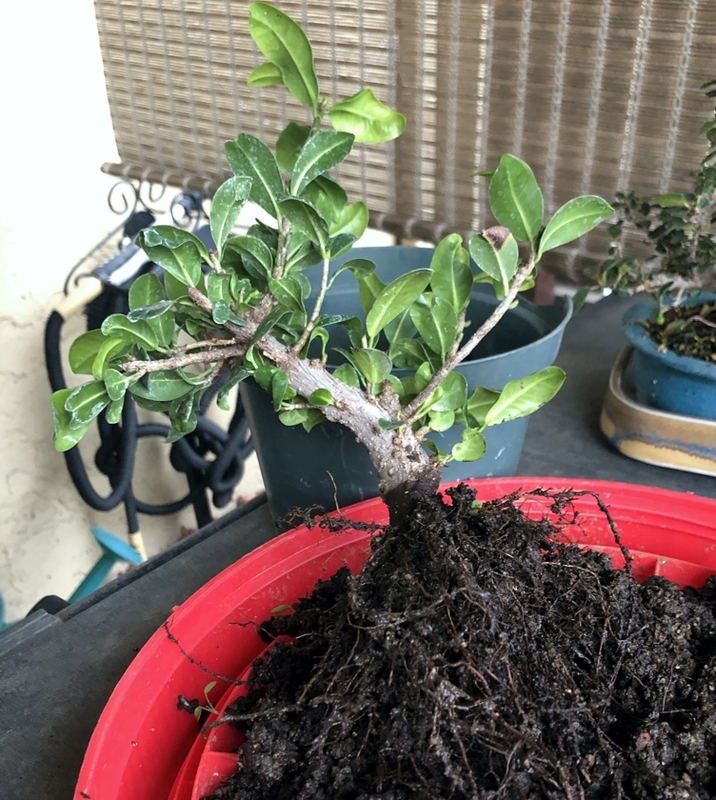 In the re-potting process I learned why the tree was suffering. 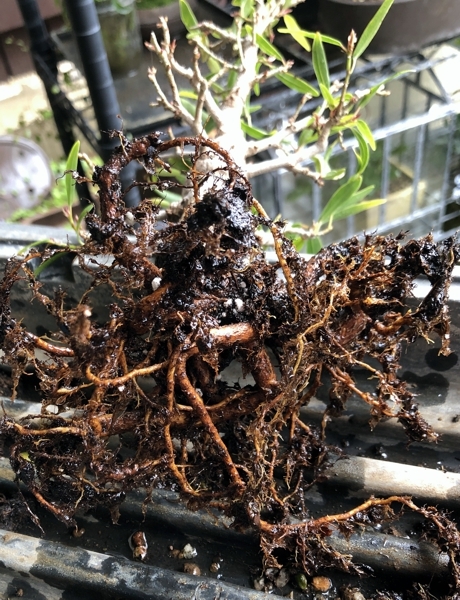 It was left in a heavy organic soil mix to retain moisture; too much moisture, and some root damage has occurred. I have moved it to well draining mix of bonsai soil and bare-rotted the tree to clean out the mess it was in. This tree will come inside for a while under a full spectrum grow-light to encourage rapid growth. Once buds are forming and temps are good outside it will move back outdoors. Willow Leaf Ficus out of it gifted original plastic pot. 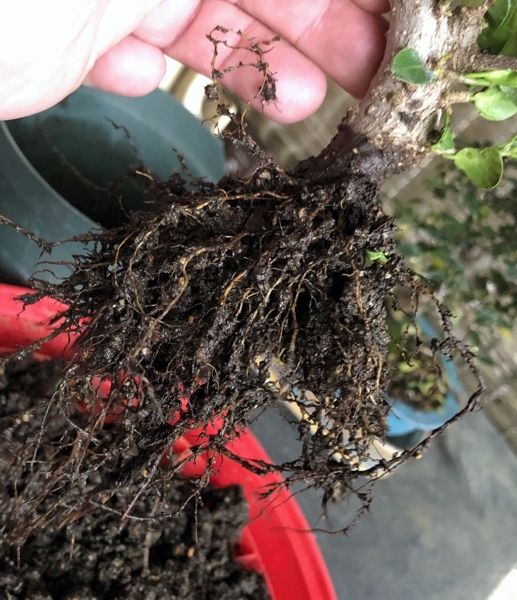 Willow Leaf Ficus in terrible potting mix that held too much water. Willow Leaf Ficus in a new grow pot. This is certainly not a great pot for the final product but the tree needs room to grow and in pot that will retain more heat. Wanted to share with my readers some of the restyling work I have been doing this Spring. Hope you enjoy. Spring in Northern California and we are still getting rains. Shimpaku after restyling this Spring.